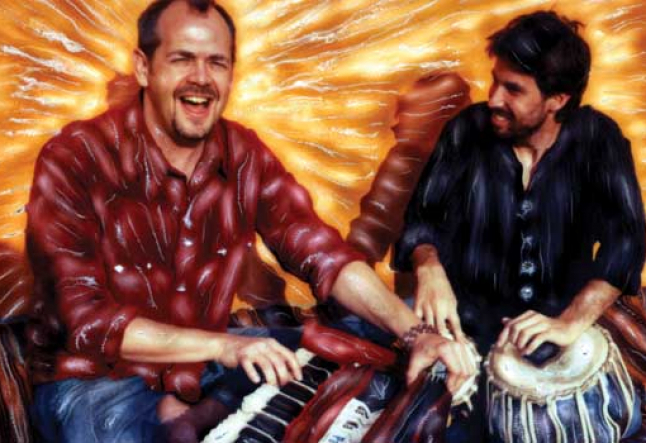 Initially trained as a visual artist and jazz musician, Dave started chanting in the early 1990s when a film editing project brought him to the ashram of Swami Muktananda in India. After returning to the US, Dave taught meditation and chanting to prison inmates, and began leading kirtan at yoga studios in Los Angeles and Chicago. In the past four years Dave and his band have toured all over the United States, Canada and Europe, giving more than 400 performances. Yogi Times: Eighty-four shows in eighty-four cities: a friend of mine said that this reminded him of George Thorogood and the Delaware Destroyers marauding across the nation in a station wagon. What do you think of the comparison? Dave Stringer: Well, I’m pretty sure that that marauding part of it is just P.R. spin. A tour schedule always looks great on paper. The idea of the road conjures up images of spontaneity and adventure and freedom, but my actual experience of touring is that it requires major amounts of planning and self-discipline. The economics of touring dictate playing five or six nights a week. We have found it essential to look at the entire tour as a yoga practice, extending the metaphor of asana to every aspect of it, repeating the sequence of asanas every day, surrendering to the pose, trying to stay aware of and follow the movements of our breath. The size of the ensemble I travel with varies from week to week. Sometimes it’s a four-piece band, other times it’s been just me and Miles, my tabla player. Everyone has different physical rhythms and emotional cycles that need to be considered. We love each other a lot, but it can be a kind of a stuck-in-a-lifeboat-at-sea experience. You need and depend on each other absolutely, but there’s no escape from each other either. Stuff comes up. Things get worked out. Music is made in spite of and because of. It’s necessary to greet each new crowd with enthusiasm, and to play with full commitment and joy. This involves offering up everything that has happened during the day, and using the practice of chanting to transform it into useful energy. It takes strength, stamina and flexibility to make it through, but my voice is actually much more clear and powerful and supple now than when I started the tour. YT: A little bird told me that they weren’t all yoga centers. Is that true? And if so, was that the oddest venue? Dave Stringer: The oddest venues for kirtan are often what would be considered to be normal venues for other kinds of music. For example, a few years ago, I was invited by a yoga studio to come and perform in Jackson, Mississippi. As far as I know this was the first time anyone had attempted a kirtan in Mississippi, and I was frankly amazed that there was a yoga studio there at all. When we arrived we found that the yoga studio had booked us into a bar. I tried to put aside my astonishment, and asked the yoga studio owner as sweetly as I could what she was thinking in booking a kirtan event at a smoky bar. She said that people in Jackson wouldn’t come to a music event at a yoga studio, so we had to go to them where they were used to hearing music. I couldn’t really argue with her logic, but I was deeply uncomfortable until I realized that she was giving me an opportunity. From a yogic perspective, any place you put sacred intention is a sacred place, including a bar in Mississippi. So I projected the mantras on a big American flag, introduced kirtan as Sanskrit karaoke, and quoted Ben Franklin to the effect that beer is proof that there is a God and he loves us very much. The crowd drank and smoked and sang along, and we ended up having a great time. By refraining from judgment and going where the people were, we probably opened a few doors and created some awareness where there wasn’t any before. YT: Everyone likes a victory but even yogis really crave a great defeat. Was there a remarkably bad show along the way? Dave Stringer: I wouldn’t say there were any bad shows, although some crowds are juicier than others. My band and I work very hard to be consistent, and I’ve learned that even if I didn’t have a magnificent time, the chant is experienced by everyone very subjectively. Sometimes people will come up to me after the show and tell me about an amazing opening they had, usually right when I was thinking, well, tonight kind of sucked for one reason or another. So I’ve learned not to judge. YT: And for our higher selves, a most inspiring gig and/or a most inspiring transcendent road moment? Dave Stringer: The most transcendent moments are often when something ordinary suddenly seemed imbued with a light or an awareness that made it extraordinary. The taste of an apple I picked in the Berkshires, the sound of the rain as we sat in silence after a kirtan in Calgary, a chance meeting on the Staten Island ferry with a long-lost friend as the sun was setting over the industrial moonscape of New Jersey, wading in the vast mirror of water covering the Bonneville salt flats in Utah the day after a thunderstorm. YT: You’ve literally just traveled through ground zero of the yoga movement in the US. Does it feel like a movement to you? A ripple? A retreat? A storm? A wave (forgive the reference)? A revolution? Dave Stringer: I’ve been on tour for much of the past six years, and have now played in nearly every major city in North America. During the 2004 presidential election campaign, my band and I played in both red states and blue states, and talked with quite a cross-section of people. You could really feel the tension and division in the country, but I was struck by the fact that everywhere I went, yoga was prospering. As unbelievable as it might seem, there is a thriving yoga community even in the Norfolk/Virginia Beach area, where many of the people who practice yoga are connected in some way to the US Navy, including one of the yoga studio owners, who is married to a Navy officer. Despite the overwhelming culture of materialism and immediate gratification, America is also one of the most spiritually inquisitive and searching places on earth, with probably more available spiritual options than just about anywhere else you can go. Many spiritually motivated people, turned off by the polarized worldviews of the religious establishments, have found fresh air to breathe in yoga. But yoga also speaks to America’s traditional values: the ethics of self-reliance, self-improvement and self-empowerment, while also addressing our concerns for finding connection to both our environment and each other. Because of this, I think yoga is in the process of becoming very much a part of the fabric of American society. The spectacular growth of the last ten years may slow a bit, but I think the cultural impact will continue to widen. Is yoga a revolution? Maybe, in that it has the capacity to increase the number of people who act from compassion and self-awareness, and that will in turn have a huge effect on the world. But the word revolution feels drastic and sudden, and I think the changes that yoga elicits are much more gradual and subtle. Still, the growth of a seed into a tall tree can be seen as both a slow, modest, incremental process, and as a rocketing toward the sky. It all depends on what time scale you want to view it through. YT: Is all that chanting just the right amount of meditation or does it ever get to be too much? Dave Stringer: I’m fortunate in that what I do continually keeps pressing the reset button in my brain. No matter how difficult my day has been, I’ll feel a lot better once I’ve finished singing. The silence that follows the music is incredibly intoxicating, but I don’t know if it’s possible to ever OD on it. I do get tired of the ‘big S’ spiritual thing though. Do we always have to put a frame around it? It’s not necessary to try to be spiritual. We already are spiritual. YT: Did you always want to be a kirtan star when you grew up ? What do you want to be when you grow up? Dave Stringer: I had no idea there was such a thing as kirtan until I got hired to go make some films for an ashram in India. I had no intention of leading kirtan on a regular basis until a yoga studio asked me if I would do it. I had no ambition to be a professional kirtan singer until I realized it was already taking up all of my time. That there even is such a thing as a kirtan star is both amusing and amazing to me. I have a lot of ideas about the directions I want to take my music in. For one thing, I’m increasingly interested in presenting kirtan as a kind of participatory theatre, and collaborating with visual artists who share my concerns and intentions. When I grow up I still want to be an architect or an astronaut or an ambassador, though I guess there’s actually some of all of that in what I do now. But how do you know when you’re grown up?